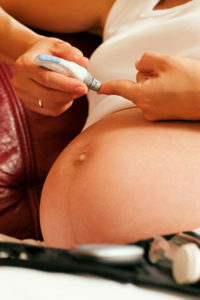 According to a recent report by Fox News, more women than ever are experiencing gestational diabetes. This news report was based on data from the American Diabetes Association, and claims that around 18% of all pregnancies currently result in this condition. The reason for the increase in gestational diabetes is largely due to more women being overweight before they become pregnant. Poor nutrition along with the fact that more women are waiting until after age 35 to conceive are contributing factors as well. Certain ethnic groups tend to be at higher risk than others are. The American Diabetes Association claims that Asian, Hispanic, Native American and African American women are more likely to contract gestational diabetes. Those who have previously given birth to a baby that weighed more than nine pounds are also at a higher risk during subsequent pregnancies. Gestational diabetes can be dangerous for the mother because it can also lead to high blood pressure and an increased risk of heart disease later in life. These mothers are also more likely to suffer complications during delivery, and are at a higher risk of requiring a c-section. The disease can also cause problems for the baby, resulting in a higher risk of heart disease, diabetes or childhood obesity. In order to reduce their odds of developing gestational diabetes, those who plan to conceive should try to maintain a healthy weight and perform regular exercise before becoming pregnant. They should also avoid processed foods and opt instead for fresh fruits and vegetables and whole grains, as these foods are easier for the body to convert to sugar.